The prices in this deal round up were accurate as of 2019-04-10 08:37 EST. The prices may have changed since then. 50% OFF Cuisinart – Velocity Ultra Trio 56-Oz. 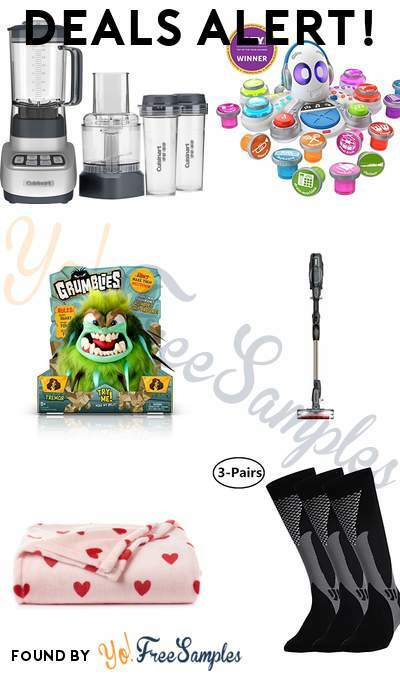 Countertop Blender and Food Processor – Silver: You can get this for only $74.99 here and it’s normally $149.99 at Best Buy. 49% OFF Fisher-Price Think & Learn Rocktopus: You can get this for only $30.00 here and it’s normally $59.99 at Amazon. 60% OFF Grumblies Tremor, Green: You can get this for only $7.88 here and it’s normally $19.99 at Amazon. 52% OFF Shark ION F80 Lightweight Cordless Stick Vacuum with MultiFLEX, DuoClean for Carpet & Hardfloor, Hand Vacuum Mode, and (2) Removable Batteries (IF281): You can get this for only $214.00 here and it’s normally $449.99 at Amazon. 50% OFF The Big One Supersoft Plush Throw: You can get this for only $19.99 here and it’s normally $39.99 at Kohls. 62% OFF Ruzishun Compression Athletic Socks for Men(Black,3Pairs): You can get this for only $14.99 here and it’s normally $39.98 at Amazon. 56% OFF Gibson Home Castleford 40-Piece Stainless Steel Flatware Set: You can get this for only $34.99 here and it’s normally $79.99 at Home Depot. 56% OFF C2G 50623 High Speed HDMI Cable with Ethernet and Rotating Connectors, 4K UHD Compatible, Black (10 Feet, 3.04 Meters): You can get this for only $8.66 here and it’s normally $19.99 at Amazon. 42% OFF Beats by Dr. Dre – Geek Squad Certified Refurbished Beats Solo3 Wireless Headphones – Gloss Black: You can get this for only $173.99 here and it’s normally $299.99 at Best Buy. 53% OFF Adesso 4148-09 Donna Tall Table Lamp Polished Nickel: You can get this for only $46.24 here and it’s normally $100.00 at Amazon. 44% OFF Denco NCAA Louisville Cardinals Voyager Laptop Backpack, 19-inches: You can get this for only $50.00 here and it’s normally $89.99 at Amazon. 42% OFF Samsonite Leverage LTE 25″ Spinner Purple: You can get this for only $129.99 here and it’s normally $224.99 at Amazon. 73% OFF Scribblenauts Showdown – Xbox One: You can get this for only $5.27 here and it’s normally $19.99 at Amazon. 66% OFF Duck MAX Strength Heavy Duty Insulating Film for Patio Door/Extra Large Window, 84-Inch x 120-Inch, Indoor, 284352: You can get this for only $4.15 here and it’s normally $12.49 at Amazon. 88% OFF Speck Products Presidio Clear Cell Phone Case for Samsung Galaxy Note8 – Clear/Clear Presidio Clear: You can get this for only $4.96 here and it’s normally $44.95 at Amazon. 59% OFF Epson S041405 Ultra Premium Photo Paper, 64 lbs., Luster, 8-1/2 x 11 (Pack of 50 Sheets): You can get this for only $15.79 here and it’s normally $38.99 at Amazon. 52% OFF Flavored & Unflavored Coffee Variety Pack for K-Cup Keurig 2.0 Brewers, 96 Count Victor Allen’s Coffee Single Serve Coffee Pods: You can get this for only $23.99 here and it’s normally $49.99 at Amazon. 63% OFF BIC Velocity Bold Retractable Ballpoint Pen, Bold Point (1.6mm), Black, 36-Count: You can get this for only $10.32 here and it’s normally $28.20 at Amazon. 63% OFF Poundex B00NNKC6VK Sectional Sofa, Black: You can get this for only $504.49 here and it’s normally $1,399.00 at Amazon. 51% OFF SanDisk Ultra 64GB Dual Drive USB Type-C (SDDDC2-064G-G46): You can get this for only $15.94 here and it’s normally $32.99 at Amazon. 50% OFF Preen Extended Control Weed Preventer, 4.93 lb, Covers 805 sq. ft.: You can get this for only $14.97 here and it’s normally $29.99 at Amazon. 50% OFF Sun Joe SPX-PCA10 10-Inch Surface, Deck and Patio Cleaning Attachment for SPX Series Pressure Washers: You can get this for only $9.99 here and it’s normally $19.99 at Amazon. 50% OFF CORSAIR – MM300 Gaming Mouse Pad with Antifray Cloth – Gray/Black: You can get this for only $14.99 here and it’s normally $29.99 at Best Buy. 48% OFF CHEFMAN – 6-Tray Food Dehydrator – Black: You can get this for only $91.99 here and it’s normally $179.99 at Best Buy. 56% OFF JSGJMY Compatible with Iwatch Band 38mm 40mm 42mm 44mm Women Men Genuine Leather Replacement Strap Compatible with Series 4/3/2/1 Sport Edition (Light tan, 38mm 40mm S/M): You can get this for only $12.99 here and it’s normally $30.00 at Amazon. 64% OFF Gold Party Plastic Cups, Mokaloo 9oz Clear Disposable Plastic Cups With Gold Rim Perfect for Parties Weddings Graduation Birthday (100 pcs): You can get this for only $23.99 here and it’s normally $66.99 at Amazon. 56% OFF Safavieh Lighting Collection Antonia Gold 60-inch Floor Lamp: You can get this for only $110.81 here and it’s normally $255.00 at Amazon. 51% OFF Ashley Blackwood Stationary Fabric Sofa with Rolled Arms Loose Seat Cushions and Pillows, Taupe: You can get this for only $465.85 here and it’s normally $968.99 at Amazon. 52% OFF Health Warrior Pumpkin Seed Protein Bars, Honey Cracked Pepper Turmeric, 8g Plant Protein, Gluten Free, Certified Organic, 12 Count: You can get this for only $7.20 here and it’s normally $15.04 at Amazon. 50% OFF OXO Good Grips 2-in-1 Salt & Pepper Grinder & Shaker: You can get this for only $9.87 here and it’s normally $19.99 at Amazon. 50% OFF MEIGO STEM Toys – Toddlers Educational Construction Engineering Building Blocks Set Best Learning Toy Gift Kit for Kids 3 4 5 6 7 8 9 10 Year Old Boys Girls (110pcs): You can get this for only $29.99 here and it’s normally $59.99 at Amazon. 55% OFF G-Floor Grill Mat, 47″ x 32″, Diamond Tread, Metallic Silver: You can get this for only $8.98 here and it’s normally $20.00 at Walmart. 74% OFF Onn 5-Port High Speed Hdmi Switch With Ir Wireless Remote And Ac Power Adapter: You can get this for only $17.99 here and it’s normally $69.99 at Walmart. 49% OFF Clue Game: You can get this for only $5.00 here and it’s normally $9.97 at Walmart. 51% OFF Gold’s Gym XRS 20 Olympic Workout Bench with Removable Preacher Pad: You can get this for only $97.00 here and it’s normally $199.00 at Walmart. 64% OFF Martha Stewart MTS-APFRT-8LB All Purpose Plant Food for Flowers, Shrubs, and Vegetables: You can get this for only $8.99 here and it’s normally $25.24 at Walmart. 46% OFF Nerf AccuStrike Elite AlphaHawk: You can get this for only $15.97 here and it’s normally $29.99 at Walmart. 66% OFF Weatherproof Vintage Mens Faux-Fur Canvas Hooded Jacket: You can get this for only $49.93 here and it’s normally $150.00 at Macys. 77% OFF Nautica Men’s Detachable-Sleeve Jacket: You can get this for only $33.16 here and it’s normally $148.00 at Macys. 84% OFF Alfani Slim Pique Bomber Track Jacket, Created for Macy’s: You can get this for only $11.96 here and it’s normally $75.00 at Macys. 70% OFF ID Ideology Men’s Varsity Bomber Jacket, Created for Macy’s: You can get this for only $22.46 here and it’s normally $75.00 at Macys. 70% OFF Under Armour Men’s Sportstyle Colorblocked Windbreaker: You can get this for only $29.96 here and it’s normally $100.00 at Macys. 65% OFF Tommy Hilfiger Men’s Whitewater Colorblocked Printed Jacket: You can get this for only $50.93 here and it’s normally $149.00 at Macys. 72% OFF Martha Stewart Collection CLOSEOUT! Grey Plaid 2-Qt. Enamel Cast Iron Dutch Oven, Created for Macy’s: You can get this for only $32.93 here and it’s normally $119.99 at Macys. 83% OFF Alfani Men’s Regular-Fit Pants, Created for Macy’s: You can get this for only $9.96 here and it’s normally $59.50 at Macys. 83% OFF Charter Club Lexington Corduroy Straight-Leg Pants, Created for Macy’s: You can get this for only $9.96 here and it’s normally $59.50 at Macys. 60% OFF Martha Stewart Collection Table Spiralizer, Created for Macy’s: You can get this for only $19.93 here and it’s normally $50.00 at Macys. 42% OFF Calvin Klein Slim-Fit Solid Dress Pants: You can get this for only $54.99 here and it’s normally $95.00 at Macys. 43% OFF Swiss Diamond 10-Piece Knife Block Set: You can get this for only $169.88 here and it’s normally $299.95 at Home Depot. 48% OFF Skandia 4-Piece Vivid Carbon Steak Knives: You can get this for only $25.88 here and it’s normally $50.00 at Home Depot. 42% OFF Swiss Diamond Premium Clad Fry Pan: You can get this for only $28.88 here and it’s normally $49.95 at Home Depot. 70% OFF Men’s ZeroXposur Krypton Puffer Jacket: You can get this for only $30.00 here and it’s normally $100.00 at Kohls. 80% OFF Men’s Dockers Chase Softshell Performance Hooded Bomber Jacket: You can get this for only $28.00 here and it’s normally $140.00 at Kohls.